There is now a video of this technique. Go to this post to watch the video. I met Susie at Quilting in the Pines last weekend. She drives a pumpkin orange (or Tangerine Tango, the color of the year!) Audi TT. And she demonstrated the coolest completely-machine-sewn binding I've ever seen! 1. 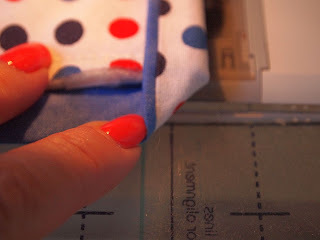 For this technique, you will need a main binding color and an accent color. Of course, you can use the same color for both -- but why bother with this technique, then? 2. 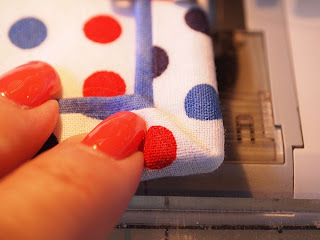 Trim the excess batting back backing from your quilt. Then measure the perimeter and add 10" or so. 3. 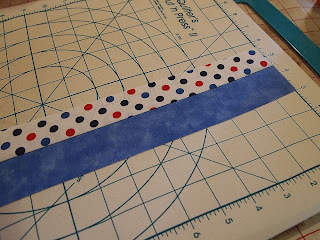 Cut as many strips of the main (outer) binding fabric as you need to total the perimeter of your quilt at 1 1/2" wide. 4. Cut the same number of flange (accent) strips at 1 3/4". 5. 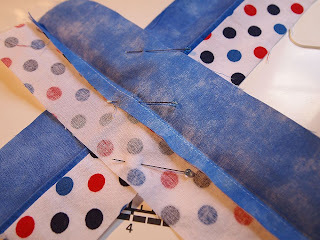 Sew the strips of each fabric together end to end. I always use a mitered join to minimize bulk. 6. 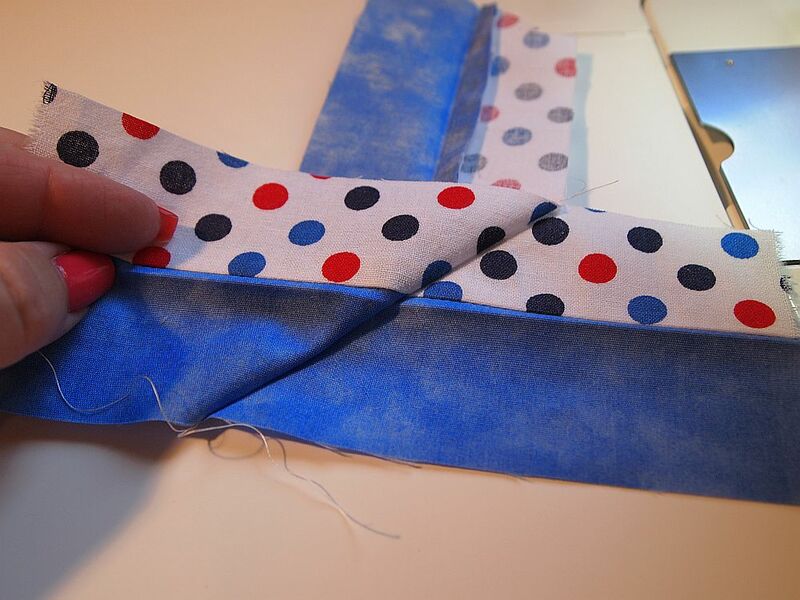 Sew the main color and the accent color together lengthwise using a 1/4" seam. 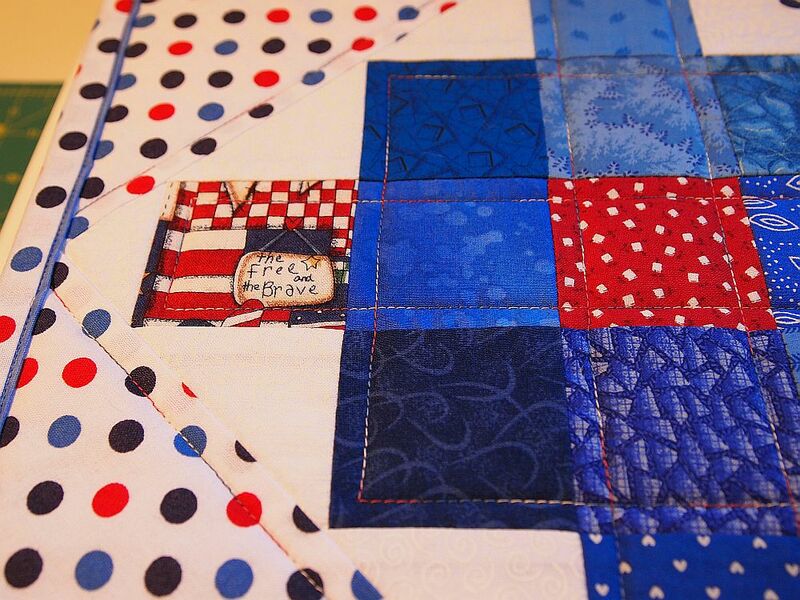 You now have two strips equal to the perimeter of your quilt. 7. Press toward the main (1 1/2" strip) fabric. 8. Then press lengthwise with wrong sides together and raw edges even. See how a narrow piping/flange appears when you meet the raw edges? 9. Leave a 10" tail and begin sewing the binding to the back side of your quilt , with the contrast color facing up, using a 1/4" seam. 10. In January I wrote a tutorial on mitering binding corners. 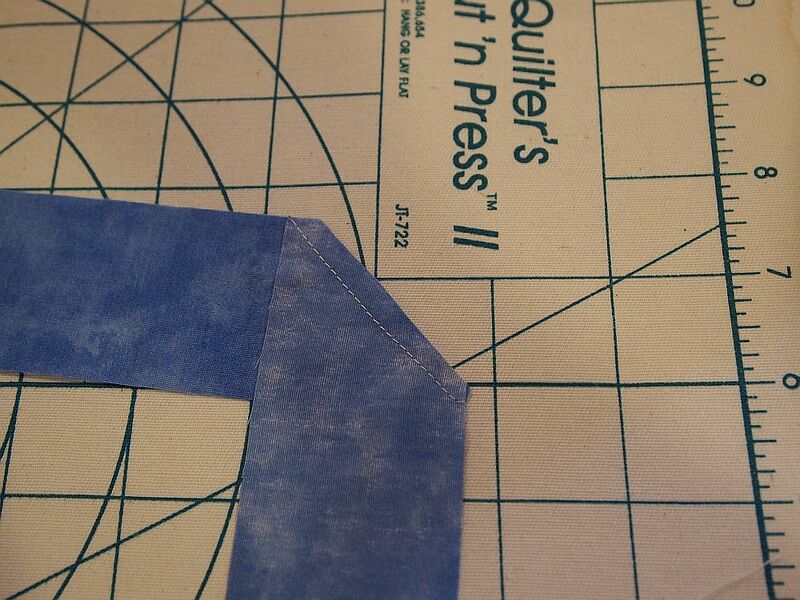 It also shows how to join the two ends of the binding. 11. 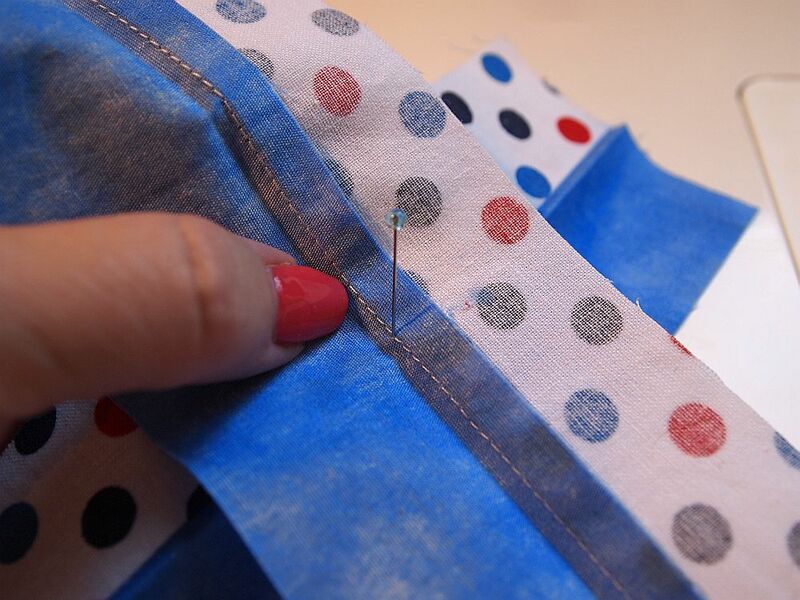 Once the binding is attached all the way around your quilt, lightly press the binding toward the cut edge. This will make wrapping the binding to the front side of the quilt easier. 12. Now wrap the binding to the front, and using thread that matches the flange (or use Superior Threads' Mono Poly) "stitch in the ditch" between the flange and the main binding fabric. And you'll have a perfect join! Doesn't this technique look great? And it's completely done by machine -- no tedious hand stitching the binding in place! 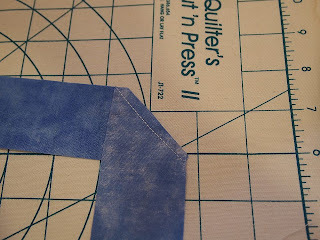 According to Susie, this technique is approved for use on Quilts of Valor (previously, they required bindings be hand-sewn in place). This will certainly be my binding method of choice from now on! Thanks, Susie! Can you see the single line of stitching just to the left of the binding at the right-hand side of the photo? That's the bobbin thread from stitching in the ditch of the Magic Binding flange. Nice, huh? Now, go forth and bind! Please note that because of an increasing amount of spam, comments have been disallowed on this post. Thanks for all your kind comments, but I know you don't want to read advertisements here, either! Oh that looks so great! Adds a really nice touch to the quilt. Thanks for the tips and tutorial! Thanks for the how-to! I will mark this for the next binding! Fabulous idea - can't wait to try that! Thank you so much for my in-person tutorial last week while you were in Idaho. Who would have ever thought binding could be fun? I love it! This looks so amazing!! And great instructions. Thank you! I love the idea of using two colors for the binding, certainly makes it pop. I do machine stitch all my bindings, but this is a cleaner look with less chance of messing up on the backside and having to stitch it again! Wow, so different, lovely! Thanks for the tute! Chrystal, I hope you will let me know how it works for you if you do try it! I am so glad you posted this and the pictures are terrifically helpful! Thanks, Oh Quilt Camp Buddy! Hope you'll let me know how it works for you if you try it on your cute yellow quilt! Looks amazing. I must try it! Ps May I pin? please? I love this!! Thanks for sharing and awesome technique!!! Thank you for this nice tutorial. I always sew my bindings completely by machine, but this method will be a nice change. Thank you for this tip and tute! I just taught my 93!! yr old Mom to make these corners for the baby blankets she is STILL making for her Greats and Great-Great Grandkids! Amazing and a Blessing! Love this technique! Thank you! Hi. I came to your tutorial for Susie's Magic Binding via Pinterest. Looks great. 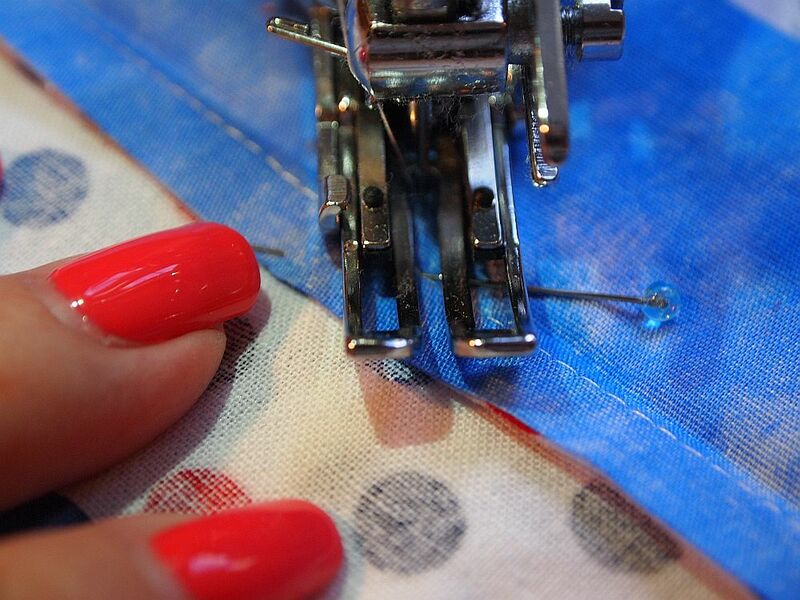 One question: If you use thread matching the "flange" to machine stitch from the front, won't it show on the back? Thanks. The top thread doesn't have to match the bobbin thread and should not show if the machine tension is correct. First make a sample of the same "sandwich" and test. Jean, I always use Superior Threads polyester invisible thread in the top and something that matches the backing in the bottom. 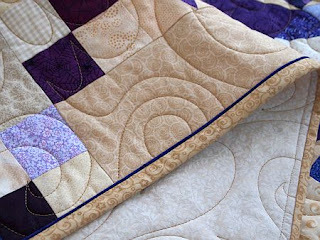 I've been trying lots of different techniques to speed up my quilting including learning free motion quilting and machine binding. I can't wait to try this one, it looks really easy and I love the accent color! I had a chance to try it, it works great! Thank you so much. I definetly will try this because I have carpal tunnel and the hand stitching just kills my wrist. I have had 7 quilts in my closet this past year that need binding work but have been putting it off. Thank you. I'll let you know how it goes. 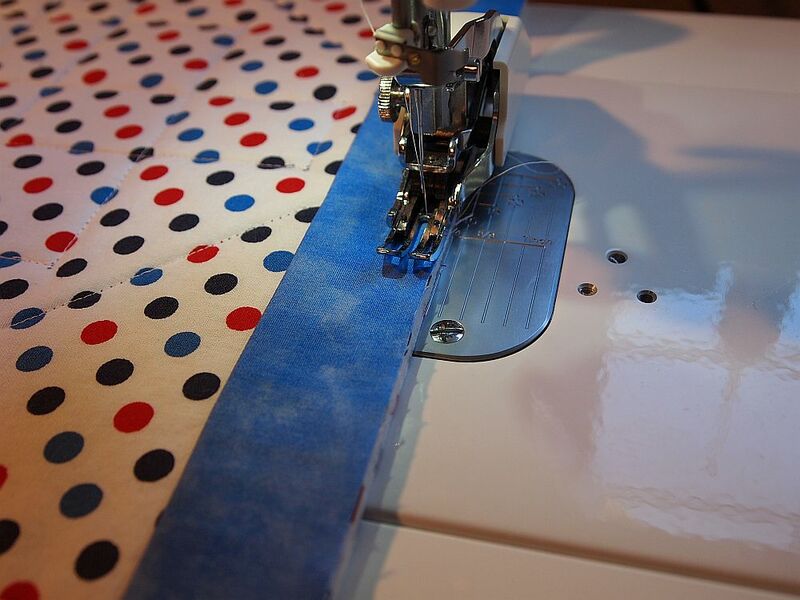 I have started attaching my binding by machine. Thank you so much for sharing a way that will make them even nicer. I had two quilts ready to bind. 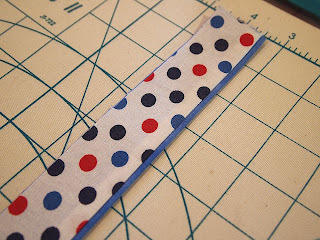 I tried this magic binding and love the results. I just finished preparing the binding for the second quilt. Two strips 360" long to sew together takes a while, but is so worth it. It really adds a special touch. Oh my goodness. It looks so nice and custom made! Thank you for sharing this. I can't wait to try it on the quilt I'm making for that extra touch. 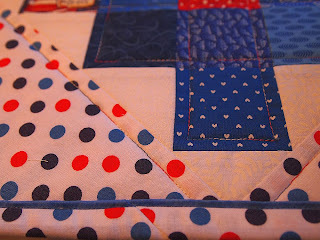 I am interested to know what the back side of the quilt looks like after stitching binding in the ditch. Could you show that also. Thanks in advance! What an awesome finish. Thank you so much for sharing. I can't wait to try this! It looks like it turns out as nice as the Ricky Tims Piped Binding, but is a lot simpler! Just tried this and it's awesome! Thanks so much! I've tried other ways and this is the best. Fancy !!! Im totally doing this. How did I not know this ?!?!?! Your the best ! Im seriously like Rain man when it comes to binding. I am going to start practicing and see if I can get more proficient with it. Thanks for the tutorial. great. I love this! Is it pin friendly? Would love to keep track of such an excellent tutorial! Oh my!!! 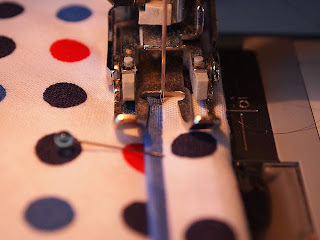 I have hated Hated binding before and always lucked out and had someone to do it for me-- I tried it a couple of times and it turned out terrible- so I really wanted to "start" to finish a quilt- well with the help of this tutorial I actually did it!!!!! Thank you x ten thousand!!!!! Came across this on Pinterest and gave it a whirl. I LOVE it. I will probably never hand sew a binding again! I too would like to know what the back looks like. Anyone willing to share? Hello, this is the frist time I am follow your pins. 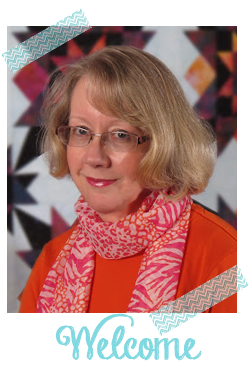 I have been quilting since 1999 and I can not wait to try out Susie's magic binding. 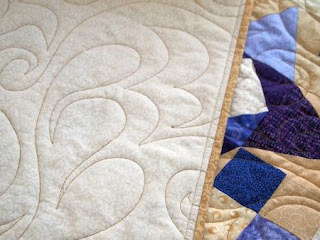 Thank you does not seem quite enough to say when you have given me a wonderful new way to add to my quilts! But...Thank you! I shall be using this as soon as I can get to that point on my 10 quilts that I have going at this time! This is amazing ... simple enough to do too! I am using this on my next binding for sure. I did this yesterday on a grandma quilt I had to finish in a hurry. It worked great! Loved it! thanks for this. I have now done 3 quilts with this binding and it gets easier every time. 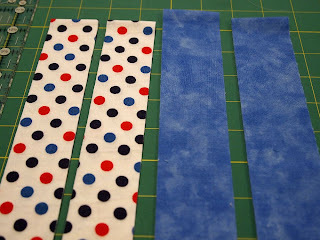 it may take a little longer with the extra step of sewing the two colors together, but it is well worth the extra work! I don't make many quilts anymore, but this wonderful method works well on smaller projects like totes. Gives them a real finished look. The directions are excellent and I can't wait to try this technique. Thanks for posting! Fresh and beautiful! Thanks for sharing! Has anyone shown the back of the quilt ? Several comments requesting to see the back after . There is a picture of a corner of a quilt finished with this technique (showing both the front and the back) on Quiltmaker's blog "Quilty Pleasures". It looks like the bobbin thread was chosen to match the back. It looks really nice! Thanks, Banjo -- I do match the bobbin thread to the backing. It makes one straight line of stitching that looks like another row of quilting on the back. I can't wait to send this to several QOV making friends. Maybe we can get more made faster? That's actually really nice. Thanks for the tutorial. I like the dotted fabric a lot! This is the BEST tutorial I have ever seen shared online. Great explanation... Great photos... and Great nails! Thanks for sharing. 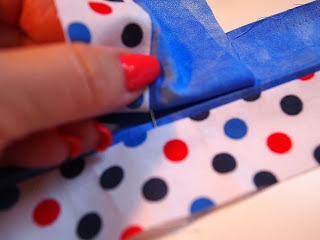 I LOVE this binding method! How does this quilt binding technique look from the back, once you stitch the binding down after wrapping to the front? It is unclear if the measurements of the binding width are such that the 'ditch' line will place the stitches in a place that will hide them? Can you share more on how this works when looking at the back? thank you for shareing this interesting idea. It sure looks gorgeous from the front! This is fabulous! Thank you very much for this tutorial. I will use this technique straight away! So ingenious! And this has what to do with the binding technique shown on this blog???????? Big DUH????? Bev, thank you -- your comment made me come back to this old post to see what it was you were writing about! Thanks for the great tut ... I just finished a baby quilt set that has flanged bindings. I used your tut to learn how ... I linked to you from my blog. 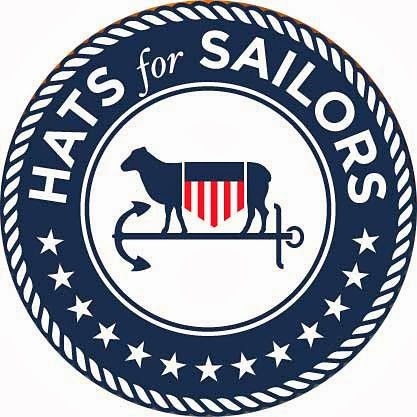 Hat Tip! What a great finish to a quilt!! Gives it that extra something. Thank you for the tutorial! And thanks to Bonnie Hunter for finding your blog and sharing the info. 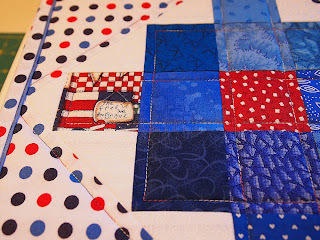 I love how easy it was to make and what a pop of color it will add to my quilt! Love it love it love it!! gonna give it try! thanks! Yay! Thanks a bunch I have a quilt I need to bind and was not looking forward to it. Now I am. This is sooooo !! easy to do and neat and tidy should have had it previous. What a clever idea to enhance a simple binding! I love it and surely will give it a try. Definitely going to try this on the charity quilt that I'm working on right now. Thanks so much for sharing. A year late and a dollar short! I just did a binding by hand, lie 10 minutes ago. WOW! this would have been wonderful! Your pics and text are GREAT!!!! Love the look of this! Thank you for your tute!!! I did this binding and it was AWESOME !!!! Pictures on my blog. What's up with comments 88-92? Very strange way to drum up business and most definitely unprofessional.